Chrome updated itself to 69.0.3497.100 (Official Build) (64-bit) and ever since then I have experienced text that has random pink, purple and blue highlights. This was corrected by entering chrome:⁄⁄settings into the chrome address area and then searching for hardware acceleration and disabling it. The USB drive is causing this. Switched to a different USB stick and the problem went away. Lesson: Not all USB sticks are created equally. I noticed this in /var/log/messages on my freshly installed CentOS 7.5 system. May 24 09:46:43 localhost kernel: Performance Events: PEBS fmt1+, 16-deep LBR, SandyBridge events, full-width counters, Intel PMU driver. Clovertown and SandyBridge processors have errata regarding PEBS functionality. The microcode is being updated as the system loads. For a number of months my laptop has done what I can only describe as a hard boot. For no apparent reasons it would power cycle. 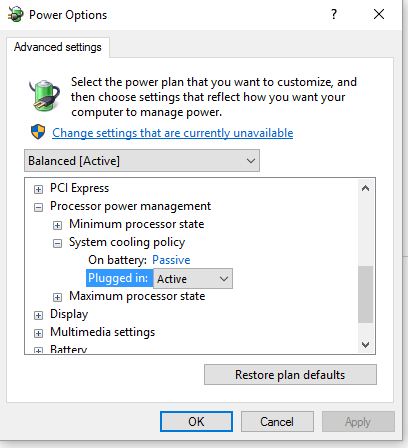 No windows shutdown message, no warning, its as if somebody has come along and pulled the power cord or held down a reset button. As this is the 2nd time its happened in less than 2 week this is really starting to cause me problems as I'm loosing work. 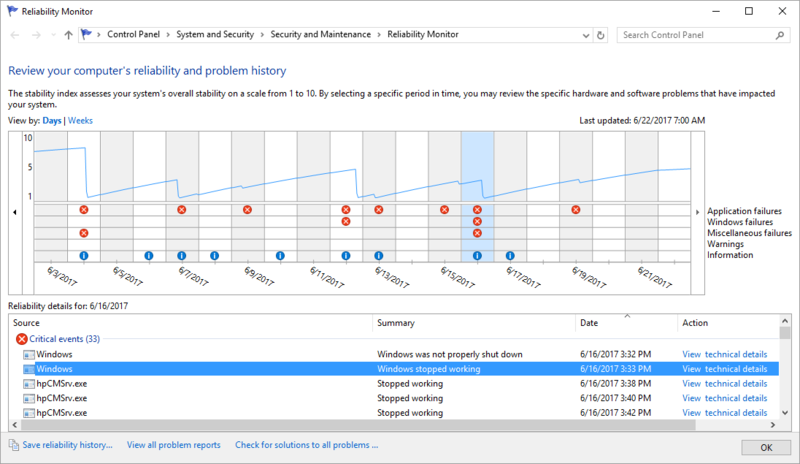 You can see the last event 4/24/2017 on the reliability history report below. The bugcheck was: 0x00000124 (0x0000000000000000, 0xffffe000f3f6c838, 0x0000000000000000, 0x0000000000000000). 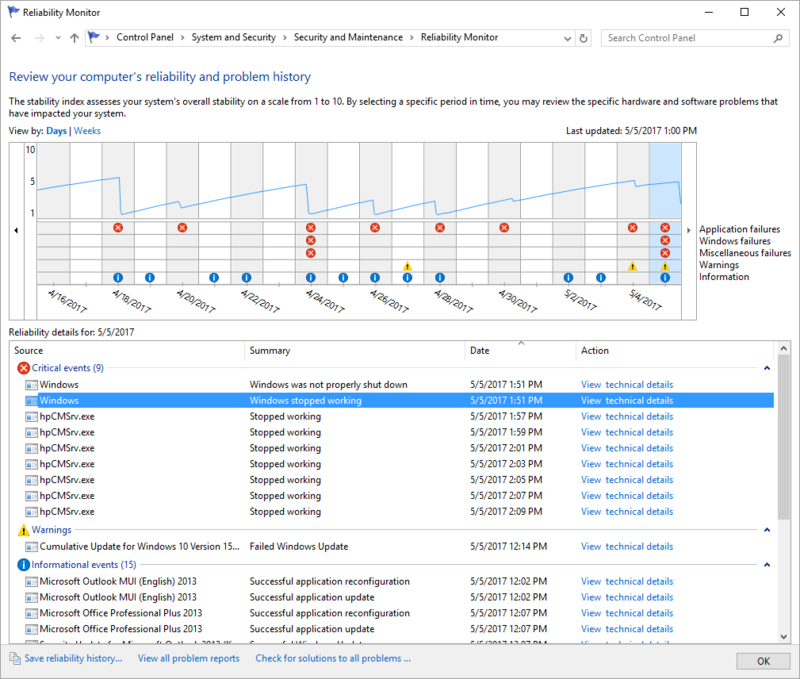 A dump was saved in: C:\WINDOWS\Minidump\050517-14718-01.dmp. Report Id: e55192e8-8d9d-45c1-8c03-e14e66640510. Well at least windows agrees with me it was not shutdown correctly. Lets see if we can find out why. 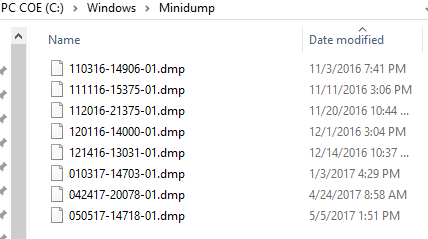 I've been keeping a log but the minidump directory has these occasions time stamped for me. As you can see this is the 8th time this has happened. After installing the WDK we need to fire up windbg which can be found here. Pulling the 0505 minidump into windbg this is what it tells us. Press ctrl-c (cdb, kd, ntsd) or ctrl-break (windbg) to abort symbol loads that take too long. Run !sym noisy before .reload to track down problems loading symbols. WHEA_ERROR_RECORD structure that describes the error conditon. Arg2: ffffe000f3f6c838, Address of the WHEA_ERROR_RECORD structure. Arg3: 0000000000000000, High order 32-bits of the MCi_STATUS value. Arg4: 0000000000000000, Low order 32-bits of the MCi_STATUS value. Your motherboard is faulty, and will need to be replaced. Wonder if this is heat related as I had this set to Passive as the FAN was noisy. Probably not that would imply that this laptop would never run on batteries ! We will change it back to ACTIVE and see if that helps any and I'll put up with the FAN spinning for a while. This machine is being returned I cannot tolerate a computer randomly rebooting. You can download the file and the use the SHA1 checksum from the URL itself to then validate the file downloaded correctly. Sounds like a good idea. It is until MS screw up the SHA1 on the URL. These are a list of filenames that I've discovered where the SHA in the URL file does not match that computed.